That's it then. All done. Purespring Watercress is officially retired. It will see the light of day no more in this form. The layout recently attended the 28th National Narrow Gauge convention here in Minneapolis, where it was very positively received by the attendees. Many of who were unfamiliar with English agricultural railways, micro layouts, and even cabinet style layout presentation. Over the 4 days of the convention I talked myself hoarse on the two full days Thursday and Friday, explaining about the farm, the railway and the operation. The highlight of the weekend for me was meeting Bob Brown, editor of the Narrow Gauge and Shortline Gazette Magazine. He was positively excited to see something this small on show and encouraged me to submit an article for the magazine. Which I shall do in the near future. The layout, though it operated smoothly over the course of the convention was not without its issues. The turnout in the scenic section could not be operated, lest it created a short in the layout causing operation to grind to a halt. The turnout in the rear too, had problems and had to have a wire soldered between the toe and closure rail so that it would operate reliably. One car trains were the order of the day, two cars would derail, The layout was really showing its age. After surviving a flooded basement and getting battered in my recent house move, it must have all been too much for the old girl. It won't see the light of day at a show again. That's not to say that I won't build another Purespring Watercress Layout. I am too indelibly associated with the concept to ignore the idea of presenting the idea in another form. Much like my favourite layout at the show. The Crowsnest Tramway, once owned by Roy C. Link and now in the possession of Craig Parry in Canada. Roys Crowsnest concept has been around in several forms and scales since the 1970's and is still going strong. That was the big thing I took away from the show. It has taken me years and years to realise this. I need to stick with what I know with my modelling projects, and work with that. Purespring Watercress, Sir Arthur Heywood and Lincolnshire Potato Farm Railways. My future layouts should be based around those. I know nothing about US Standard gauge and Narrow gauge. I don't need to try and create something that American modellers are doing far, far better than I. So it looks like I will be selling off all my American stock. It will free up some space in our new house, and probably even help finance the new layouts. Perhaps even bringing life back to this old blog too. It's been a while blog readers. I'll try and do better at keeping this up to date. 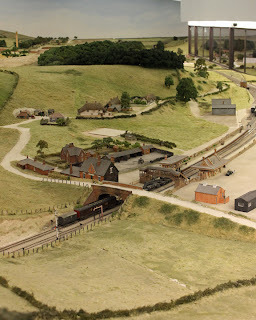 I need a clear out in the model railway room. I started with the best of intentions. "Never throw anything away" is one of my mottos. It's probably why I have so much stuff in the model railway room in the first place. One of the first things I found was some structures from an idea I had for a 1:35n2 underground munitions store layout. 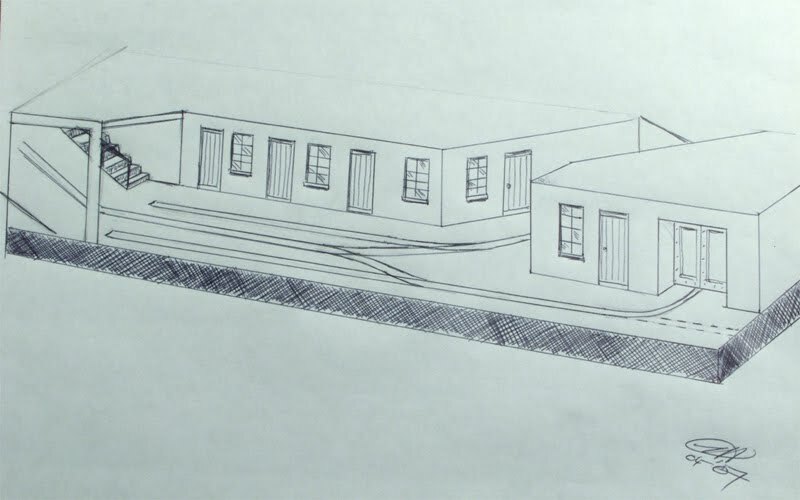 The original Underground munitions store layout concept. It was one of the first layout plans I posted on this blog, back in 2006. The idea goes back even further than that. I kept the buildings and rolling stock I'd started on because I thought the whole concept was a good idea and I was sure I'd come back to it one day. That might well have been today. The result of the wonderings is clear to see. The structures do fit in quite obviously. The track plan as laid is a simple "tuning fork" design. Though it would be easy to fit in an extra siding in front given the short size of the flat wagons I converted from Bachmann On30 vee skips. On the track at back you can see the Eimco compressed air loco I started work on at one point. A cave wall would be an interesting scenic development and murky lighting would add to atmosphere. Clearing out the model railway room has come to a stop. Life in the old blog yet. Oh my. Would you just look at that? Four and a half years since I posted to this, the most popular of my blogs. 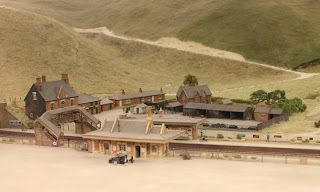 It's not that I wasn't producing model railways. Those were APA box layouts and got posted on the APA box blog. 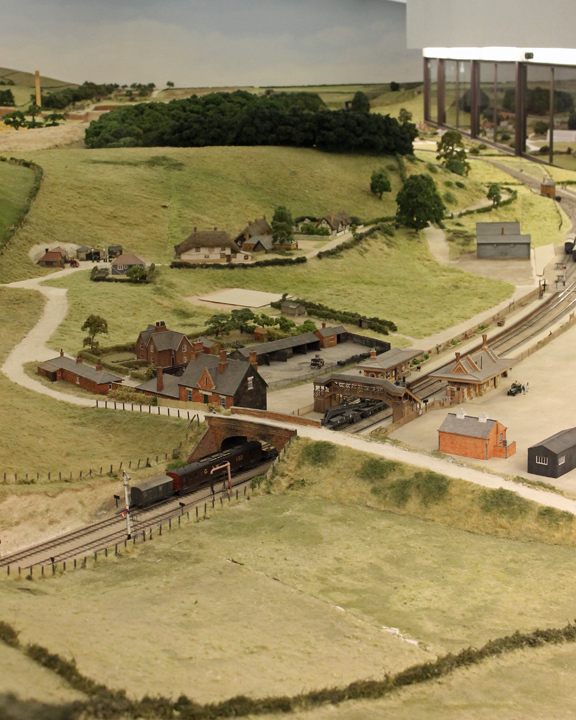 Then my famous Purespring watercress layout got refurbished for its 10 year anniversary and that went into its own Facebook page. Too much stuff going on and too many places to report them. There's a lesson to learn there I think. One thing that had stimulated my creative juices in the interim had been the discovery of pictures of the Naksup wayfreight in Alaska and its car float operations. I had investigated this quite thoroughly and built up quite a library of reference material. However, life got in the way and the project got shelved. 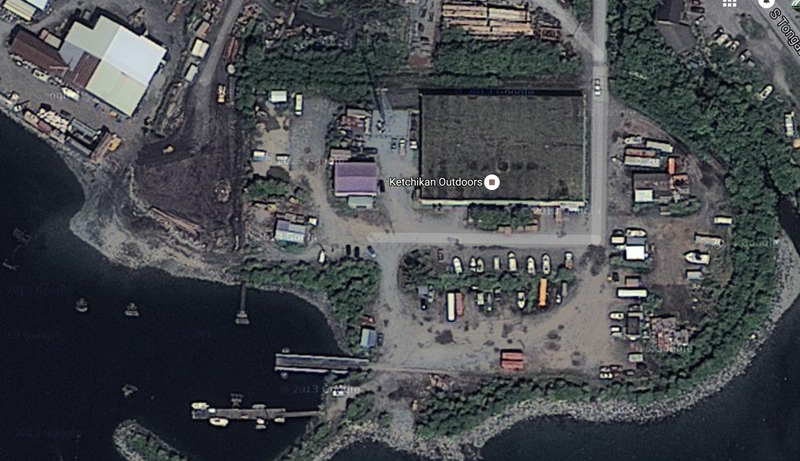 That was until a few days ago, when I discovered the Saxman Terminal Railroad, also in Alaska. A remarkably compact site, the entire length of the system was be less than a mile in length and there was only one turnout. Model Railroader magazine delights in producing schemes for an 8' x 4' baseboard, well here's an entire railroad you could fit in that size with almost no compression. Saxman terminal. It looks to be out of use, but the marks of the track can be traced easily. When I had previously investigated car floats for a layout I was thinking in terms of Z scale so my thoughts were drawn there. You could model the entire location in about 3' 6" x 2'. It's a very interesting locale, from many points of view. My interest was most definitely piqued. Studying the pictures I realized that the Micro Trains through girder bridge could be used as a basis for the car float bridge. As I happened to have a couple of them in my possession I decided to see if my thoughts were right. I think they were. Decking added from embossed styrene sheet. Of course, the dock is only any good if you can have a car float berth at it. So I gave some thought to the construction of a car float. The pictures that follow are a "proof of concept" rather than a scale model, just to see if it works. I buried MTL roadbed track into a styrene substructure and got this. Car float model. the cars run on the track and don't derail. After that it was a natural thing to want to see how everything looked together. It looks OK, doesn't it? It's very tempting indeed to want to carry this on and develop it further. Now I need to look further into how I would present an idea like this to the viewing public. 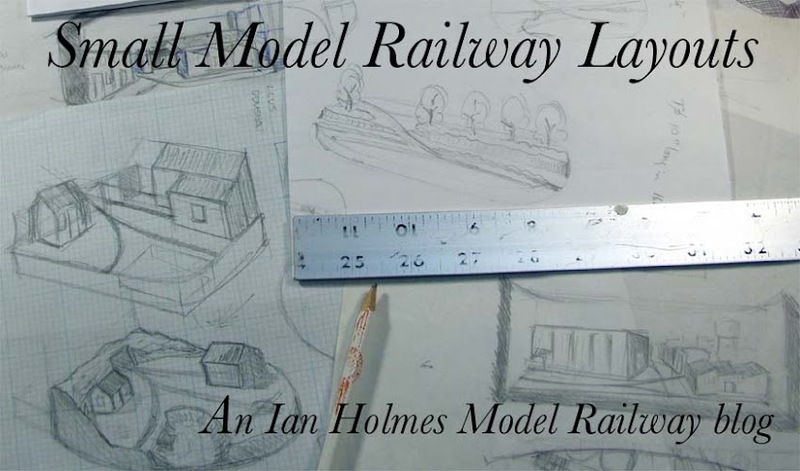 Watch this space, or perhaps even the Facebook page The Model Railways of Ian Holmes. Once again I make a foray into the blogosphere. This time I'm finally coming clean about my experiment with the APA box. You will be able to follow that blog here I do hope that you'll stop by. Nothing can prepare you for The Vale Scene. Sounds a bit like a tag line for a movie doesn't it? Perhaps I'm overhyping it a bit. Take a look at the picture below. This is the view that greets you at the top of the stairs from the Dartmoor scene. It's nothing much. A view across countryside in 4mm scale. 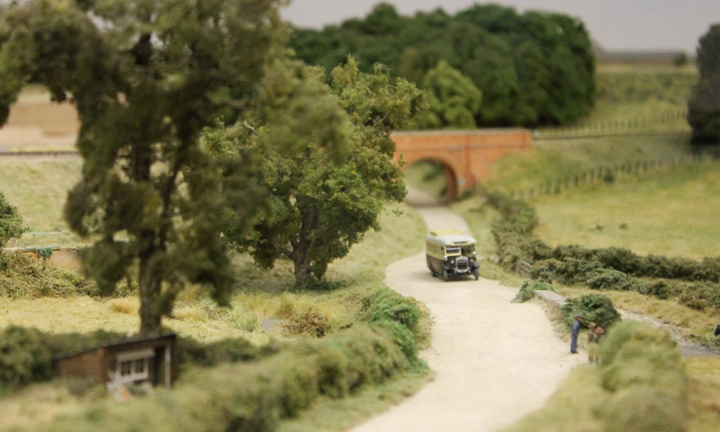 A clump of trees, a railway embankment and not much else. Then you realise that the backscene is about 15 feet away. The "nothingness", the space is almost overpowering. In this hobby of ours we are used to dealing with selectively compressed scenes and many modellers advocate using buildings in smaller scales as you recede to the horizon to create the illusion of distance. Here there is no compression, no use of smaller scale buildings to create the illusion of distance. See that farm in the distance? It's 4mm scale too. 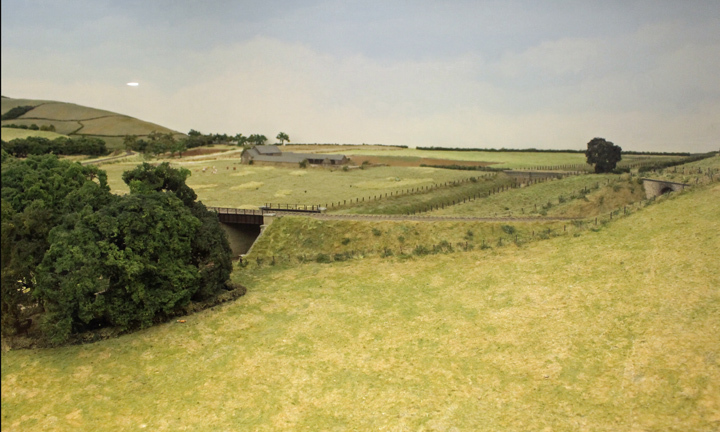 Above: Then there is the structure modelling that Pendon is rightly famous for. Finely finished highly detailed structures, built from card and painted with watercolours. That's right, no embossed styrene sheets here. Each model is painstakingly built from card and the bricks and stonework are embossed and then painted by hand. The roofing tiles are either applied individually or in singles rows depending on the builder. A typical structure like this one probably has in the region of 200 hours work invested in it. 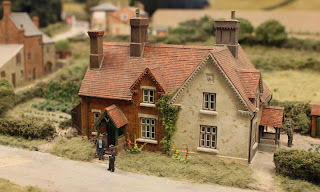 I remember seeing Pendon Cottage modeller extraordinaire Chris Pilton doing a demonstration stand at a show many years ago. I was amazed that people could do such work. I remember going away inspired and building my own superdetailed buildings for a while. My guide tried to get me to contribute to Pendon by building something. I was honoured to be asked. Do my standards reach those advocated by Pendon? There is of course only one way to find out. Above: A bus drives down a country lane. Nothing else. So incredibly natural and realistic. Above: A slice of English country life now gone. 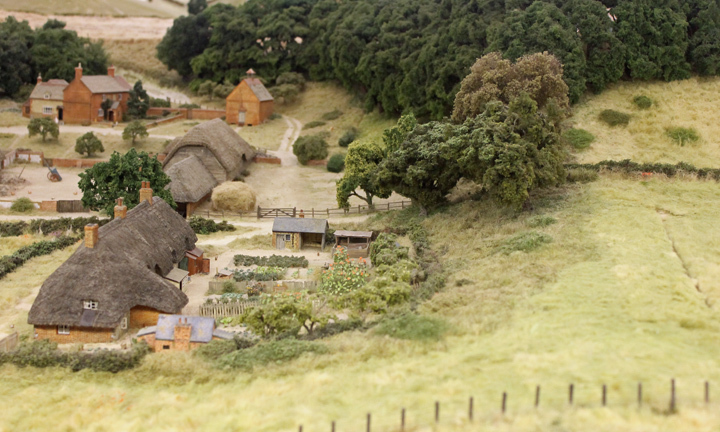 Above: This farm scene is beautiful. Above: Even though the railway runs through the Vale, in the time I was there I only noticed one train running through it. This last picture shows the full depth of the Vale scene. From here the backscene is over 70 feet away that's one scale mile. The day I was there, thanks to inclement weather overnight, attendance was low so my wife and I were lucky enough to basically have personal guided tours of the Vale scene. So we were able to have lots of the details pointed out to us. I, as a modeller, was able to discuss some of the techniques and what it takes to model for Pendon. I hope these pictures have whetted your appetite to visit Pendon and you make a visit in the near future. Being close to a Oxford, a major tourist centre, it should be easy for any self respecting modeller to trade a trip to Pendon against visiting some of the historical sights there. Should your significant other (and family) though it is very likely that everyone will come away having enjoyed a trip to Pendon. So what can we small layout railway modellers learn from Pendon? You'd probably think "nothing at all" being that Pendon is over 1,000 times larger than my latest APA box creation. But I think you'd be very wrong. The importance of space. 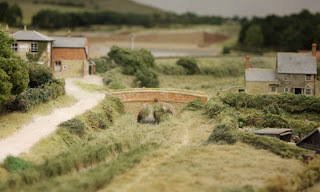 Yes, Pendon takes this to the extremes but I think that we small layout modellers tend to think that because we have small layouts it's important to cram as much track as we can into the area to get good operation. Not so. Absorb the details of the real landscape, see how buildings relate to each other. Only in intense urban situations are buildings slapped down one next to another, one on top of another. I feel each structure, each wagon/car needs its own "space". I know there are people feel uncomfortable when someone violates their own "personal space" in a crowded area. Shouldn't we accord that same respect for space on our model railways? Attention to detail. This one is absolutely blindingly obvious. Detail draws viewers into the model, to look closely. To spend more than a minute looking at your display. Detail doesn't have to be a fully furnished room interior. Though if you have a structure at the front of your model with plenty of windows I certainly suggest putting a high level of detail in there. Of course I don't just mean detail on that level. There you go two things you can take away from Pendon and employ on your layouts that will make your layouts better. My, this was a long post I hope you weren't too bored by it.